An exceptionally cold winter has seen the ice coverage over the Great Lakes being extremely high. Lake Superior has experienced the latest ever recorded start to shipping. 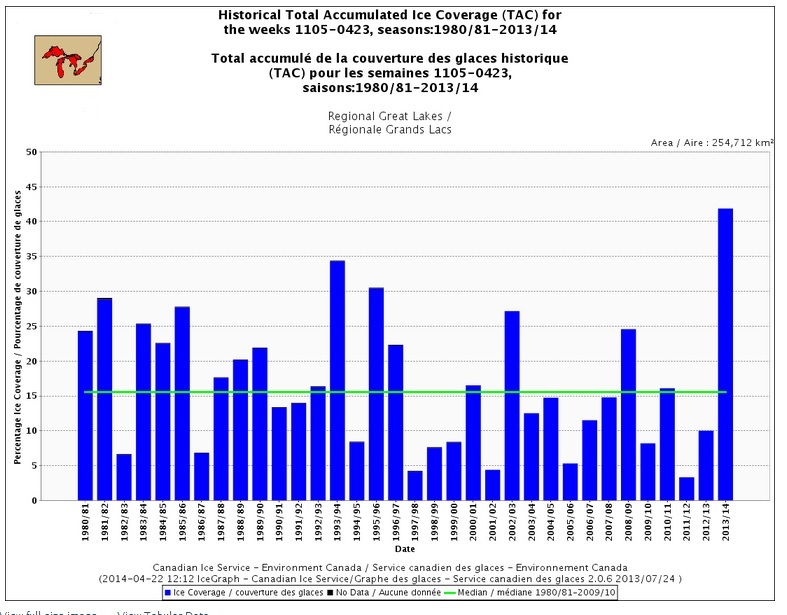 The total accumulated ice cover since 1980/81 and till 2013/14 shows no sign of any global warming. 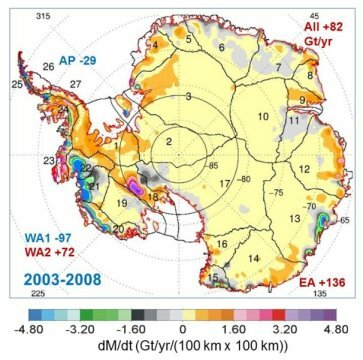 The season 2011/12 with its low ice cover was often “produced” as proof of global warming. By that standard of proof, 2013/14 clearly demonstrates that global cooling is upon us and a new ice age is on the way. There is more ice cover in the Great Lakes than there has been for twenty years. For this week the ice cover is just under 80% compared to the long-term average of just under 20%. That hardly provides any evidence of “global warming”. It is nothing particularly extreme either — after all it happened twenty years ago. 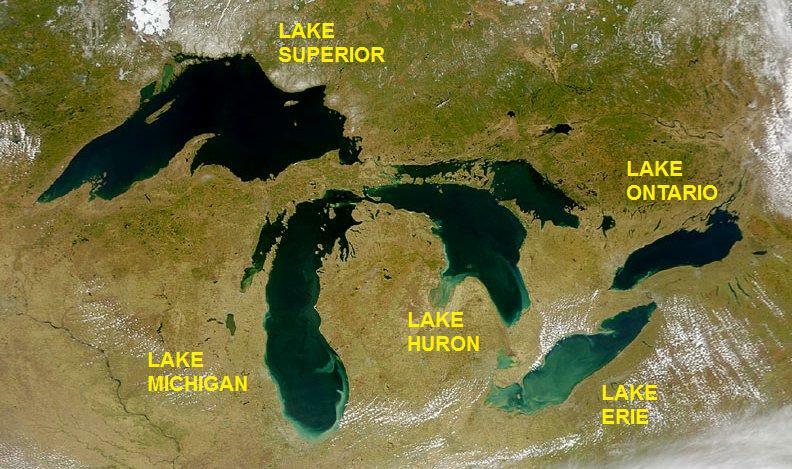 The only conclusion that is supported is that there has been little – if any – change in the climate over the Great Lakes over the last twenty years. 19th March:The Canadian Coast Guard says it is sending more icebreakers to help clear shipping channels in the frozen Great Lakes and St. Lawrence Seaway. “What we have committed to do given the extreme conditions is to bring two more assets (icebreakers), as well as a hovercraft, to facilitate the opening of the seaway,” Mario Pelletier, the coast guard’s assistant commissioner, said from Ottawa Wednesday. Faced with the worst ice conditions in 20 years, Pelletier said it is too early to say when freighters filled with grain and other commodities will be able to move normally through the trade corridor. ….. A section of the seaway between Lake Ontario and Montreal is frozen but it set to open March 31. Shipping channels west of that area are choked with thick ice. “The conditions at Thunder Bay and the Sault Ste. Marie system is very extreme and the eastern portion of Lake Erie,” Pelletier said. There are already two coast guard icebreakers in the Great Lakes. One additional icebreaker is to be in the seaway system by Friday, Pelletier said. It is to be joined by another icebreaker and a hovercraft early next week. More coast guard ships could follow. 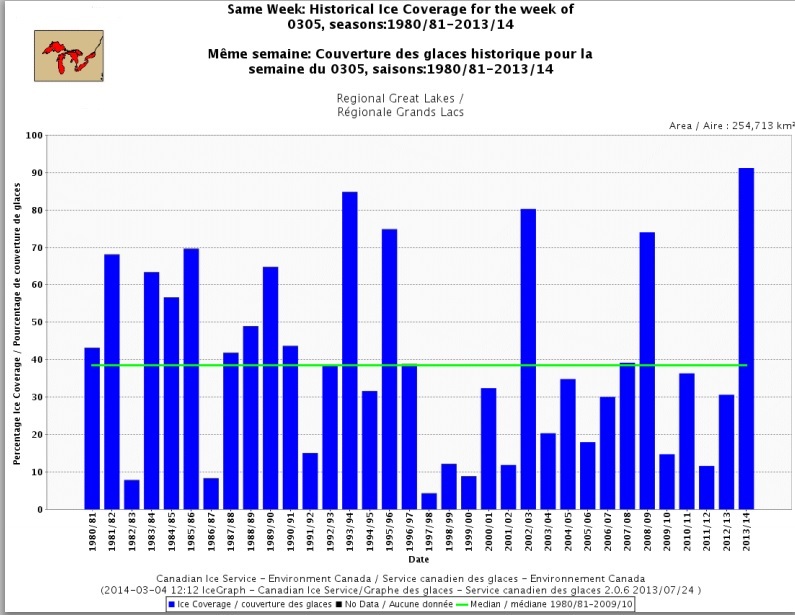 The Canadian Ice Service graph below shows the historical extent of ice cover on the Great Lakes for this week of the year – currently more than four times greater than “normal” at just under 80%. Ice cover on the Great lakes typically reaches maximum in the second week of March and the median since 1980 is at about 40%. 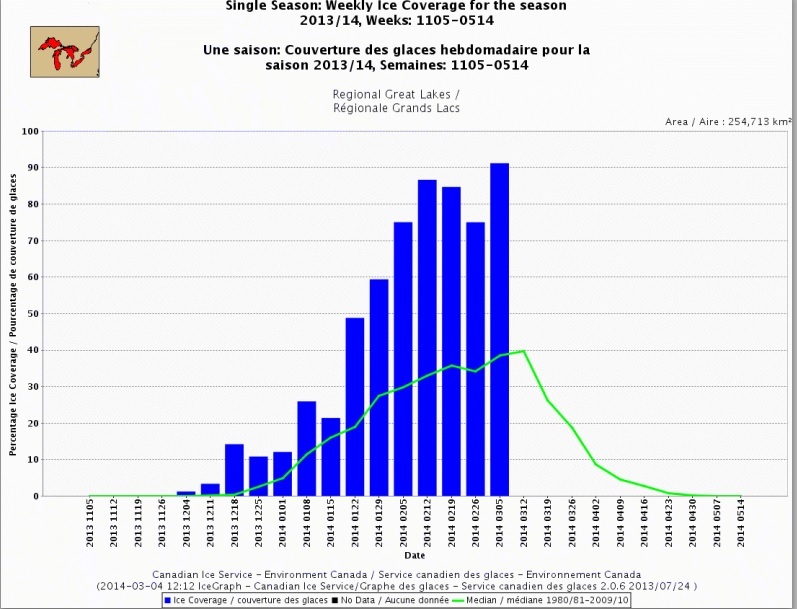 This week ice cover reached over 90%. Maximum in a “normal” year would be reached in the second week of March. Both the diagrams below are from the Canadian Ice Service with the first showing ice cover historically for this week (since 1980) and the second showing the ice cover for this season (2013/2014) with the median for 1980-2010. This season ice cover is running at more than twice the median values. Global warming contortionists will no doubt find strange and convoluted explanations to show that this massive increase of ice cover is not inconsistent with global warming. The missing heat could be hiding in the deep waters around the world and Nessie is probably running a fever. Of course this massive increase of ice cover is also not inconsistent with the start of another Little Ice Age. The most parsimonious explanation is that the climate and weather are going through their “natural variations” (due directly or indirectly to the Sun) and that there is no missing heat. Which leads to the obvious – but politically incorrect – conclusion that man-made global warming is – at most – insignificant.